As Florida bee keepers battle colony collapse, hurricane damage and pesticides one lawmaker is looking for solutions--in the form of a license plate. Rep. Melony Bell (R-Fort Meade) wants lawmakers to approve a specialty bee keeping license plate. She says the funds would help cover the cost of research. 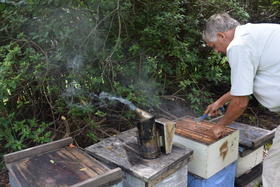 Tom Nolan is a former president of the Florida Bee Keeping Association. “Bee keepers from 27 states bring their bees to Florida to winter every year. We are the bee nursery for the Eastern United States and just like when the snow birds come and bring their colds and the flu—all those bees bring their problems to Florida as well,” Nolan says. Nolan says the University of Florida has a unique ability to conduct bee research. The Bee Keeping Association partially funded a bee lab at the school, but he says funds are needed to pay for projects. “What we did when we built the bee lab here is we built the premiere bee lab in the United States. It is the only bee lab that can do 12-month a year outdoor research. What we need now is we need some funding. And what we’re looking at is bees are really popular right now. When we go out to a bee club, people are lining up to buy the bee plate,” Nolan says. Officials say bee keepers lose 40-to-70 percent their bees each year and they’re not sure why. But Bell, whose husband is a bee keeper, says figuring that out is important. She points out bees are an essential part of growing food in the U.S.
“If you went to a produce market right now and you were to walk into a Publix and walk around, 80 percent of every vegetable in that market needs to be cross-pollinated by a bee. We no longer have domestic honey bees, so beekeepers are very important,” Bell says. Drivers who request the plate would have to pay a $25 annual fee. At least 1,000 people would need to sign up for the plate in order for it to get printed. If the bill passes the new plate would join a list of more than 100 specialty plates available in the state. Copyright 2019 WFSU. To see more, visit WFSU.